Cerebral Palsy: how could stem cells help? Cerebral palsy affects approximately two in every thousand children in Europe, and is the most common physical disability in childhood. It causes a wide range of physical symptoms, which include difficulties walking and coordinating movements. No cure has yet been discovered. So could stem cells help? Cerebral palsy is a group of physical and mental disabilities that are caused by damage to a child’s developing brain during pregnancy or shortly after birth. In many cases the exact cause of brain damage is not known. Patients with cerebral palsy often have difficulties speaking, moving, eating, and controlling eye movements; some patients also have learning disabilities. There is no cure for cerebral palsy. Therapies focus on helping patients deal with symptoms and improving communication. Some medications are available to help patients relax stiff muscles and address feeding problems in babies. Studies are only in very early stages of examining how stem cells might be used to treat cerebral palsy. There are currently no approved stem cell treatments for cerebral palsy. Researchers think neural (brain) stem cell treatments might be help to restore some function to patients. Transplants of neural stem cells or drugs that activate natural neural stem cells could repair and replace neurons and other supporting brain cells. Preliminary studies also suggest that another type of cell - Mesenchymal stromal cells (MSCs) – may also release substances that promote natural brain repair processes. Each case of cerebral palsy is unique, making understanding the causes and implications of this disability very difficult. The developmental process of the brain in humans and animals are incredibly different. This makes studying and testing new treatments for brain developmental disorders exceptionally difficult and results found in animals may not translate to humans. Using stem cells to rebuild the brain of cerebral palsy patients will be incredibly challenging because new cells and neurons will have to be correctly wired into complex networks of thousands of other neurons in the brain. How is cerebral palsy treated now? Can stem cells treat cerebral palsy now? Cerebral palsy is an umbrella term for the effects of damage to a developing brain by various causes. It is connected with a range of symptoms, including muscle weakness and movement problems. The damage to the brain usually occurs early on in its development, either in the baby during pregnancy or during the period soon after birth. Symptoms may include difficulties in walking, balance and motor control, eating, swallowing, speech or coordination of eye movements. Some people affected by cerebral palsy also have some level of intellectual disability. No two people with cerebral palsy are affected in exactly the same way. Examples of cells found in the brain: Many different types of cells interact to carry signals around the brain and between the brain and body. Cerebral palsy is difficult to treat because it can involve damage to all of these types of cells and their connections. Each child is unique, and cerebral palsy takes different forms depending on which area of the brain has been damaged. Doctors usually make a diagnosis after looking at the brain injury using an MRI brain scan and considering the patient’s most dominant movement problem. They also monitor the child through developmental milestones such as sitting, crawling, walking. There are four main types of cerebral palsy: spastic, dyskinetic, ataxic, or mixed when the patient has more than one movement disorder. Spastic cerebral palsy is the most common form, accounting for around 80% of all cases. This type typically involves muscle tightness, which makes movement difficult and can affect speech and bladder control. It can affect part or all of the body. Many patients with spastic cerebral palsy also have some involuntary movements and are therefore referred to as mixed. Dyskinetic cerebral palsyaccounts for 10-15% of cases, and is often one of the most severe forms of cerebral palsy. It causes involuntary movements, changes in muscle tone and also affects posture and/or movement. Ataxic cerebral palsy accounts for around 5% of cerebral palsy, and affects fine coordination of movements, for example balance, posture, gait, control of eye movements and depth perception. Today’s therapies focus on making the symptoms of cerebral palsy more manageable. There is no cure, but teams of healthcare professionals work together with the patient to tackle the different aspects of their cerebral palsy. This might include physiotherapy and occupational therapy to improve movement and mobility, as well as speech therapy to improve communication skills. Muscle relaxants are available to tackle muscle stiffness, and other medicines are available to help with feeding problems in babies. A number of specialist organisations provide support for families and information on available therapies. Early identification and intervention is generally encouraged and believed by many health professionals to significantly help in managing cerebral palsy. There is still some uncertainty about how early and what type of intervention is best, but promising results have been reported from studies that require active participation of infants with cerebral palsy. Research into stem cell therapies for cerebral palsy is still at a very early stage of development and no proven treatments are currently available. Various new strategies are being explored using stem cells, but it is unlikely that any of them will offer a full cure. Instead, they aim to limit the damage to cells in the brain and reduce the symptoms. Cerebral palsy is so difficult to treat because it often involves damage to many different types of cells in the brain. Severely damaged cells can be lost completely. Scientists expect that future treatments will aim to protect and repair damaged brain cells before they are entirely lost. This means it is likely that any new treatment will have to be applied within a small window of time, between the initial injury that has caused damage and the onset of permanent cell loss. Today, researchers are using several different types of stem cells to study brain injury in animals and explore the possibilities for developing new treatments. In some of these studies, researchers appear to be able to reduce damage to the brain and animals show some improvements in their symptoms. However, these effects in animals are not yet fully understood, and what happens in animals in the laboratory may not be an exact match for what will happen in human patients. Much more research is needed to determine whether stem cell-based treatments will be a safe and effective approach to treat cerebral palsy. The brain and spinal cord contain cells called neural precursor cells, which can develop into the specialised cells of the brain. One idea is that these neural precursor cells could be transplanted into cerebral palsy patients or used to make new nerve cells in the lab to replace lost cells in the patient’s brain. However, if this turns out to be possible, it is an extremely long-term goal. Any new cells transplanted into the brain would need to connect correctly with the complex network of millions of interconnected cells carrying signals around the brain. This is hugely challenging and carries serious risks, so researchers believe other approaches will provide results sooner. Although there are clinical studies investigating the benefits of stem cells, it must be emphasised that currently there are no clinically approved stem cell treatments for cerebral palsy. There are a number of clinical trails by reputable institutions listed on clinicaltrials.gov that are investigating the effects of cells injected into the brain of cerebral palsy. (Please note that this public website only lists clinical trials. It does not check if the listed clinical trials are safe or scientifically sound.) These studies are investigating the potential for stem cells to help protect and repair damage in the brain. Neural precursor cells from the brain and spinal cord are being investigated in animals as a tool for supporting damaged tissues in the brain. A study using rats, in which neural precursor cells were injected into the brain after an injury, found that the injected cells released chemicals that helped to lessen the extent of damage to neurons and specialised brain cells called oligodendrocytes as well as help damaged nerve cells survive. These early findings are now under further investigation. Mesenchymal stromal cells (MSCs) are being tested in mice to investigate their use for reducing brain damage. These cells can develop into cells that make up bone, muscle and circulatory tissues. Although MSCs cannot develop into brain cells, some studies indicate that after being injected into the brain or bloodstream of mice, these cells can travel to the damaged part of the brain and release substances that stimulate the body’s own repair systems and support the recovery of nerve cells. Scientists are working to understand how this effect is achieved in the mice, what role the injected MSCs play, and whether it is possible develop this approach into a safe and effective therapeutic for people. MSCs are of particular interest to researchers and clinicians because they can be isolated from a variety of sources, including fat (adipose), muscle, bone marrow and umbilical cord blood. (The latter two are particularly common in clinical studies.) However, it should be noted that these cells are controversial. MSCs were (and sometimes still are) referred to as mesenchymal stem cells, and many individuals believed that these cells help repair damage in the body by creating new cells. Researchers have since determined that these cells don’t naturally exhibit all stem cell properties when in the body. This has made it less clear if MSCs only assist the body’s repair process by releasing molecules or if they also contribute by generating new cells as well. Also, researchers have not fully agreed on the protein markers that define MSCs and some researchers argue that these cells differ in ability depending on the tissue they are isolated from (e.g. MSCs from fat versus umbilical cord blood). Our brains naturally contain stem cells capable of making neurons and the many other cells that make up the brain. Another possible route for treating cerebral palsy is to develop drugs that encourage a patient’s own stem cells to become more active, create new cells and repair damaged areas in the brain. Researchers hope studies on brain stem cells and nerve cells in the lab will help identify the kinds of drugs that could be useful for this purpose. Which of the various types of stem cells would be the best to use? How can we obtain the cells we need in large quantities? What is the best way in which to use these cells and how will they affect the body? If we plan to inject cells, should they be injected directly into the damaged area of the brain, or into the bloodstream? When does the treatment need to be given for the best result, i.e. is there a window of time after which the damage becomes permanent? Is a treatment that stimulates the stem cells already within the brain a better solution? The safety of any treatment also needs to be established through many stages of research to reduce the risk to patients. For example, a particular safety issue with stem cells is that they are highly capable of dividing and multiplying, meaning they have the potential to form cancerous tumours. Scientists therefore need to know exactly how the stem cells will behave when used as a treatment, and this will take time. Although you may find clinics offering stem cell therapies for many different diseases, there are no stem cell therapies for cerebral palsy that have been proven safe and effective. If you are offered a stem cell treatment, consult your doctor and read Considering a stem cell treatment offer? for additional advice. This factsheet was originally created by Nia Powell. Reviewed in 2014 by Ali Fatemi, Veronica Lynch, Megan Munsie and Iona Novak. Reviewed in 2016 by Megan Munsie and Iona Novak. Edited in 2018 by Ryan Lewis. Reviewed in 2018 by Megan Munsie. Image of a mother and her daughter with cerebral palsy by Libby Welch, Wellcome Images. Image of neural precursor cells differentiating by Nina Callard, Wellcome Images. 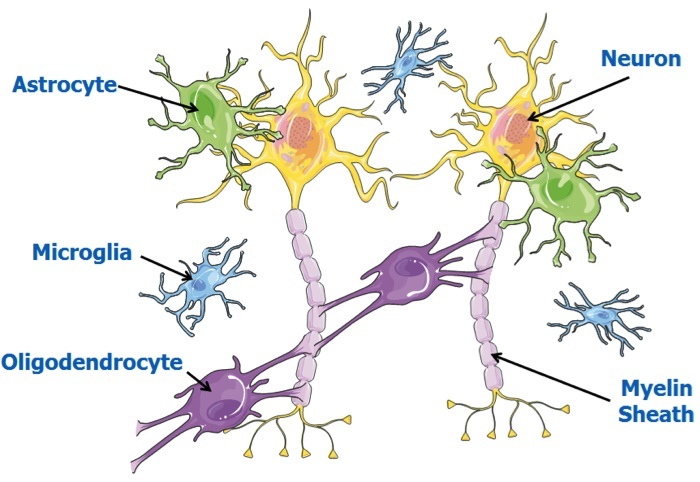 Illustration showing examples of nerve cells found in the brain created by Nia Powell using Servier Medical Art. Neural precursor cells can differentiate (or specialise) to form several different types of cells found in the nervous system - neurons, oligondendrocytes, astrocytes. Neural precursor cells can also copy themselves, meaning they can be multiplied in the laboratory to give large numbers of cells.